Toyists are in the middle of society more than ever. This movement presents itself with new élan, and with various projects it emphasises that a fertile breeding ground exists which can be used for spreading her ideas and range of thought. Toyism is borne by and carried out by a group of artists operating internationally, surrounding themselves with a number of fixed rituals. The artwork excels by versatility and contains chameleon-like characteristics. We operate as a collective, instead of separate individuals, hence one toyist cannot be seen as more important or famous than the other. There is no rivalry among the artists. The evident message we carry out is that the artworks count, not the artist itself that has created it. Although the artists do make their own art, in many occasions we work together, which means that the produced artwork cannot be attributed to a single artist. Our secret manifesto Mother (written by Dejo) contains a palette of ingredients from which mainly paintings, but lately also sculptures, silkscreens, jewelry and glass art emerge. The manifesto is only meant to be read by the attending artists. The artworks can be seen as children of Mother and one or more parents (the artists). A parent can be either a man or a woman, or even more artists representing one parent next to Mother. This can be established because of the anonymous characteristics of the parents. Every parent mixes ideas and characteristics with properties of Mother. This strongly connects the children, after all they arose from Mother. We focuse only on our creations, in which we leave our mark in the world as individuals, but we don’t reveal our identities. Each toyist picks one letter from the alphabet and creates a name for him/herself beginning with that letter. Therefore each toyist is known under a pseudonym and there can never be more than 26 toyists. That is why we always wear masks (when pictures are taken or cameras are present) whenever we are working on a particular project. A style or direction in art does not arise from one day to another, but often evolves as a compliment or reaction to other styles. In addition, the notions of different cultures or a combination thereof generate various ideas and ideologies that can lead to a particular movement. The ego era in which we have lived for quite some time now was for me one of the major reasons to take a different course. Toyism was created in 1990 when I made a graphic composition with the title “Escape of the Computer Spiders”. This graphic work consists of a powerful play of lines that merge into areas which on the one hand are standalone but on the other hand lead to entirely new forms. A playful display of colors and the combination of figurative and abstract forms forces the viewer to embark on a quest within the labyrinth of lines and colours. Large computers transform into spiders and are in search of reality. This and several similar works that followed were the origin of the toyism style in the early nineties. But it took another two years, with even the game Super Mario playing a role, before the blend of characteristics and its symbolism radiated enough strength and energy to be described in a manifesto. That occurred on 5 September 1992, literally underground in a converted windowless cellar in the center of Emmen. Written with an old-fashioned pen, toyism and its notions of colour, form and technique officially saw the light of day. A secret manifesto of not more than a few A4s, legally authenticated, formed the basis of what was to become a new movement in art. The toyism style can be divided into two periods. Periods, which both artistically and personally differ greatly; the first period lasted about 7 years (1992-2000),and the second period is from 2002 up to the present. The first period can most easily be described as a trio that often operated and functioned as a duo. Exhibitions were centrally organised from my gallery in Emmen. The figurative paintings were simplistic in design, in surrealistic themes, and often painted in lively and bright colors. An important element in this period was the recurrence of a fixed ‘logo’ (computer, space shuttle, teddy bear) in each painting. This recurring ‘logo’, which I later considered a limitation, is in fact one of the reasons that the style became recognizable. In a playful manner the logo was included in the theme; pole-vaulting spaceshuttles, or computers producing fried eggs. Everything was possible. On the other hand, some of the paintings were often referred to as childish. A statement made up by writer Wim van der Beek that was not shared by us at the time, but in hindsight appears to have a considerable basis of truth. After all, teddy bears are indeed a pretty common sight in nurseries and children’s rooms. For me personally, the first years have been important for the development of the style in order to reach the next level. The foundation had been laid but the style was still in the early stages and needed much more development. That development did occur, but only later with the arrival of new artists. 2001 was a transitional year. Toyism as a group of three no longer existed. It was over and done with. Goals for the future were contradictory and views on growth and development were no longer shared. Each went his own way. It was time for reflection. For me as the spiritual father of toyism I held fast to this style and felt that what had transpired could lead to new insights and opportunities. But the manifesto written by me in 1992 did not longer up to my expectations. I went on a trip through Asia, got a lot inspiration of the people and their culture and rewrote a great number of points in the manifesto giving toyism a new vision and ideas. The year 2002. The highly egocentric character deeply rooted in the arts became the basis for another ideology; the individual would play second fiddle to the group without sacrificing on the personal level or in quality. As the sole remaining advocate of toyism I went in search of new sympathizers, much like I did in 1992; a mixed group of professional artists from around the world with diverse cultural backgrounds, working in various disciplines, who can influence and enrich the style and, importantly, who put the art in the forefront and not themselves. As an artist you have the privilege to tell your own story and depict it, and you are in the position to do so. That gives you a feeling of freedom. If you are able to combine this freedom with other soulmates a bond is created, an intrinsic magic that benefits and inspires each other. This was among other things the basis for the current toyism. A strong cooperation between people who can dissociate themselves from the ego that has too deeply penetrated our society. This is also the reason why all the current toyist artists paint under a pseudonym: they appear anonymous, yet form part of the toyism as a whole and collectively represent it. The current toyism consists of a close-knit and talented international group of artists with different backgrounds but at the same time with like-minded views of how to experience this art and inspire each other. What makes toyism for us so interesting is that each artist, no matter what their background or belief, can express themselves in this style without losing their own value or feeling. Whether his/her interest is painting, carving, clothing and jewelry design, drawing or transforming buildings, everyone retains their own character, and the different themes brought forward give new insights and thereby strengthen the common ideas. The language of toyism tells us how you can reflect and interpret feelings and emotions with lines and dots, and how you can use colours and forms to express the story. Post 2000 toyistic art shows a strong sense of more than just the global issues that affect our times, it also reflects the pleasure that we have in life. From ecology and environmental pollution to our love for the Earth and the animals… Of wars, and yet the hope for world peace… From the inner, individual struggle to the quest for self-improvement. Toyism is more than ever an art style with a message. Stories are revealed by means of symbols, bright colours and extremely precise details. The work of the toyists focuses strongly on the observer, with whom they wish to establish an interaction by the awareness of communal, social or psychological mechanisms. In the border area between fantasy and reality a play on stories and images is created, which encourages a further journey of discovery. Wennigeb has followed the direction publicity drawing at the Municipal Institute of Decorative Arts and Crafts in Antwerp . Afterwards she left her creativity almost 15 years for what it was. She has kept an eye on toyism for a couple of years now and it has encouraged her to pick up painting some time ago. Now she finds it time to awake the techniques which she already owned in the past, as toyist Wennigeb. Jaf’r has been active as a graffiti artist by a different name for over 25 years now and therefore experienced in working against the elements of nature. Dejo and Jaf’r met back in the early 1990s just after the founding of Toyism. Dejo had a gallery and Jaf’r asked him to exhibit his graffiti work on canvas. A renewed encounter in 2003 led to accession of Jaf’r as a Toyist. When Aniyina was a little girl she was asked what she liked most of all. “Drawing!”, she said. And what comes second? “Painting!”, she said. And that has remained the same throughout her life. Then she went to the Art Academy. She also spent a lot of time abroad, making study trips to countries that had a form language that was appealing to her, such as Peru. She recognized drawings from her childhood. Then Aniyina got her hands on a book from the Toyists and that was the beginning of a new/old way of painting for her. Fihi graduated in 2000 at the Academy for Expressive Arts in Tilburg. Her majors are graphics and painting. She has worked in different styles, using her own name, since. One of the Toyists noticed a painting of hers, saw a potential Toyist in her and that is how she got in contact with the group. She decided to join and is currently busy working with toyist paintings. Toescat is the born New Yorker alias American male of the Toyism family. He has had many exhibitions in the world. All of his creations are brewed in Chiang Mai, Thailand where he now lives. He has fulfilled many assignments and commissions, painted trains and subways and exhibited paintings at well-known galleries. Toescat is his pseudonym within the Toyists. His bright, contrasting use of colour and the many influences from other civilizations are obviously put by him to practice in his work. Eiiz is an artist born in Malaysia. As long as I can remember I made drawings and paintings. I love to paint in bright colors and use theme’s from the nature and culture of Malaysia. My educational Background: Sekolah Menengah Damansara Damai and Sekolah Rendah Taman Tun Dr Ismail. I got inspired by Ibrahim Hussein, Tam Zoyah, Van Gogh, Salvador Dali and Picasso. Art Academy CABK Kampen Holland. Started in 1990 an art gallery in Emmen. Netherlands. Founder and writer of the manifesto “Mother” that has served for the foundation of the art movement Toyism in 1992. Dejo organised many exhibitions in the Netherlands and abroad. Next to being an artist he is active as a designer, a writer and as a musician. Kixoz has a background in communications and media. After his study he worked for himself in photography and video. This was also what brought him into contact with toyism. He learned the techniques of painting under the guiding supervision of founder Dejo. Now he has found his place amongst the toyists. My name is Gihili. I connect impetus with the frames of life that are raised. Toyism is a style in which I can project my feelings. My preference now is making sculptures. I have the best teacher you could wish for, Toyist Srylyn. Qooimee is an Icelandic Jane of all trades, being educated and graduated as a jazz musician, but only music cannot soothe her needs for expressing through arts. She started making her jewelry using the technical knowledge learned through her education as a dental technician and dusted her pencils and started drawing again. Then her eyes were drawn to Toyism, those alluring and deceptively simple forms drew her in and engulfed her, only to persuade her that through Toyism, she can express herself. Clamaoing is an artist from Beijing, China. She is sensitive and observant by nature and has excellent painting talent. She has a profound knowledge of Chinese culture and art. For several years she worked as an art director and painted many scenes for animated movies. Clamaoing decided to give up on her office job and follow her dream. In her exploration of art, she met with psychology and spirituality. She regards beauty as her belief and wanted to express her deep feelings about the world in a special form of painting. Connect with the world. In her search, she met Dejo, with wich she got romantically connected. What could be better than a romantic and creative journey together? 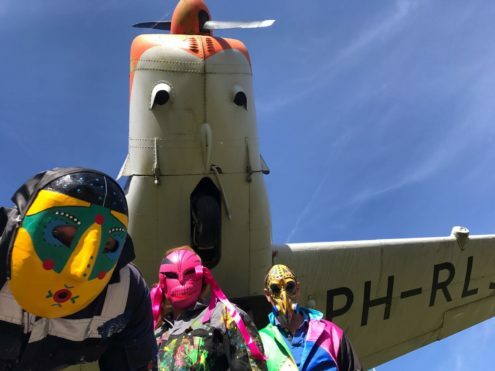 It was after a predestinated re-encounter between the reassuring Dejo and himself that convinced Roq of his abilities towards expressing his creativity within Toyism. Although he never had followed any course of the Arts, he never has had a shortage of any ideas whatsoever, either. He had worked with Dejo for years, before. During the first mentioned trade, music. Therefore, they know each other very well. The openness, cooperation and collaboration are the foremost important reasons for Roq to join toyism. Hribso graduated from The Academy of Fine Arts in Bucharest. After graduation he worked as an illustrator for various publishers, collaborated with comics in numerous magazines and worked for a while in a cartoon studio in Bucharest. Toyism was love at first sight. As soon as he saw the first toyist work he said: Behold the movement I want to follow all my life! It’s playful, it’s colorful, it’s fun. So, for Mr. Hribso, toyism is the toy he always wanted. Nooiya studied Graphic Art at the Academie Minerva and Graphics and Photography at the Cooper Union University of Arts in New York. She won various designing contests and painted them on large billboards in Amsterdam. She started her own studio in 2007 succesfully designing avatars and animations for virtual online games but recently fell in love with the concept of Toyism where the leading idea is a playfull mind expressing yourself with beautiful colors into a playfull art painting. Nooiya feels inspired by the toyism phylosophy and also feels it’s a privilege to create art with like minded souls. It is her passion to make the world more beautiful through artistic paintings and she’s convinced she can share this concept with other toyists. Zigowst is from Kansas, USA and has been creating for as long as he can remember. As a child he was always doodling and drawing, started creating more formal works in his teens, and has been painting and drawing ever since. A fascination with the creative process, and the idea of art has a limitless expressive outlet for the spirit, are what drives his ambition. He has eight years of experience as a professional custom picture framer, working with thousands of pieces of art in the process. This helped to enhance his color theory, design skills, attention to detail, and archival framing techniques. Lodieteb is an American painter of Dutch and Chinese ancestry, who has been based in Australia for several years. Besides painting, she has also worked in a variety of media including printmaking, digital media/multimedia, installation and glass. With an extensive exhibition history, Lodieteb has had more than a dozen of solo exhibitions as well as numerous group exhibitions. She studied at the University of Western Australia and the University of Sydney. Mwano has studied design. And works as a graphic designer and fashion illustrator at a large business in the city of Cape Town. She travels around the world. She has always worked as an independent artist in her own free time. Mwano was born in the city of Cape Town, South Africa and graduated in the middle of the nineties at the National School of Art in Braam Fountain, Johannesburg. Her exuberant color use and graphic precision, declare her interest for Toyism. With the unmistakable African influences in her work Mwano will and can strengthen Toyism certainly an international art. Srylyn has studied at the art academy of Rotterdam until 1986. He is since then (thus now for 23 years) artist of occupation and he has specialized himself in 3D work for the outdoor country house space, by which the use of color has not been shunned. Sometimes there is interfaces with the work of the Toyists. Although successful as an independent artist he accepted the invitation to be part of the collective. Just no soloist, but a part in the whole. With his anarchist impact its one learning process to find sufficient freedom within the draft of tied rules. Bliissem graduated from the Academy of Modern Arts in Amsterdam. After a period in which she made realistic art she started using more and more techniques. To Bliissem creativity doesn’t know any boundaries as she loves to move flexible and energetic, inspired by the Mother manifesto. Anyway, it felt natural for Bliissem to join the toyists. Yicazoo is the toyism artist from Lima, Peru. Graduated from the Art Academy he has already gained much experience in free work. Toyism is for him a playful and colourful expression of his feelings and ideas. The toyism group is certainly open to new artists and will be limited to 26 before no more pseudonyms can be assumed. First step in the process is contacting the Toyism Studio to express interest. Go ahead and write if this sounds like your style. Life is short. Play with art? Can you play with art? The artist collective known as the toyists think you can. They campaign against the common laws of art. They use playing as a starting point for a new sort of art and they lay down their artistic credo – which handles usage of form, style and vivid colours – in a manifesto. These were the first words from Frans Haks, former manager of the museum of Groningen, opening the toyism exhibition “TOYISM NOT FOR BABIES”, held in 2004 at a large art gallery in the south of Holland. Unfortunately Frans is no longer among us, but toyism still operates similarly. Toyism started in 1992 in Emmen. Toyism is based on a manifesto. This manifesto is written on the 5th of September 1992 and is called ‘Moeder’, the Dutch word for mother. This manifesto can be seen as the mother of all their works of art and it is stated as a notarial deed in 1993. Its content is known only by the toyists and will not be revealed to the public. Things like usage of colour, technique, form etc… are mentioned here. But of course it is the artist himself/herself determining what he/she produces. Why is the name ‘Moeder’ used? Mother is the origin and with her characteristics she delivers an important contribution to every piece of art produced by the toyists. Better stated, Mother always leaves traces of DNA in them. Mother relates to a partner, a male or female artist. This partner also leaves its traces of DNA. Their relationship produces offspring, children representing toyism art pieces. The artworks always contain characteristics of both, Mother and her partner. But, because there are different partners, (Mother isn’t very particular 🙂 all the children are different too. Someone from Malaysia has another background and culture than, for instance, somebody living in Iceland or the Netherlands. This is a nice phenomenon, because that person uses its own ideas, opinions and notions in the toyism style, causing a true enrichment, the style becomes even more interesting. Within toyism pseudonyms are used. Every artist comes up with his/her own pseudonym and signs his/her work with that chosen name. The name starts with a letter from the alphabet that is not already in use by another toyist. Currently there are 21 toyists within the group, so the maximum number of toyists is 26, obviously. As can be seen in the brochures and on the website their faces are never revealed! We wear masks as soon as a camera is in sight and we are recognised only by a toyism puppet and/or a toddler photo. The puppet/toddler photo and the pseudonym are linked to the pieces of art. It is not the person and his/her face that counts, only art is important. This aspect leads to acting as a group, rather than an individual; this is the basic principle of toyism. Want to become a toyist yourself? and the toyism training program!